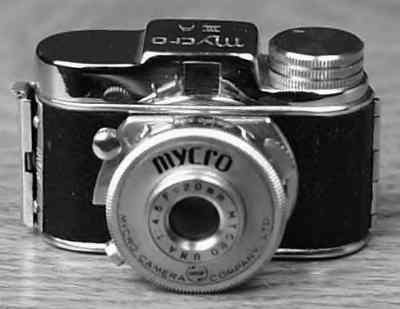 17.5mm cameras are often called "MYCRO" cameras because the Mycro cameras appeared in the late 1930's, well before the Hit cameras (early 1950's) and used 17.5mm film. (1938) A very early "Hit"-type camera. Fixed-focus 20mm (f4.5-11) lens. Speeds of B, 1/25 - 1/100. It has a square viewfinder on the top. With these features, the Mycro series is one of the higher-quality, versatile Hit-type cameras. Because of it's popularity and features, Hit-type cameras are oftentimes referred to as Mycro cameras and the Mycro format, which have even evolved into Micro cameras and the Micro format. So it gets confusing, but I guess it's easier than referring to these cameras as "17.5mm cameras with the features and shape of common post-War Japanese popular cameras". (1940) A slightly modified version. The lens and shutter are the same. The only difference is that with this model the viewfinder is built-in to the body -- a styling approach used on most "HIT"-type cameras. (1946) After the war, Sanwa picked up production again. There first postwar model is referred to as the model I, but it closer to the prewar model II than the prewar model I. The lens and shutter are the same as the prewar model II, but the face plate is different. (1949) The lens and shutter are the same as the postwar model I, but the camera has a different face plate.